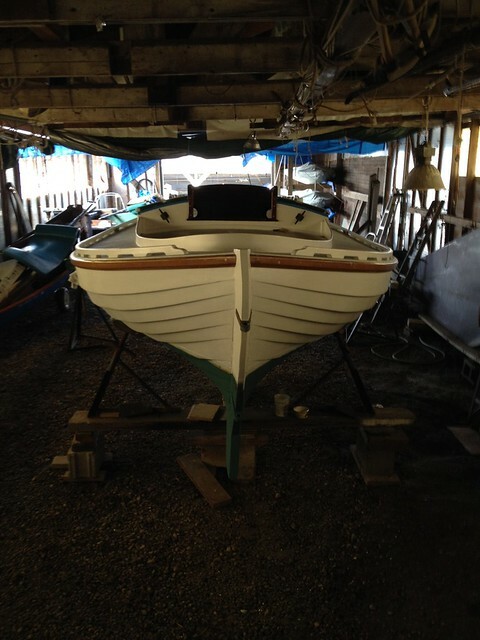 Sjogin’s resting comfortably in the slip in the south shed. 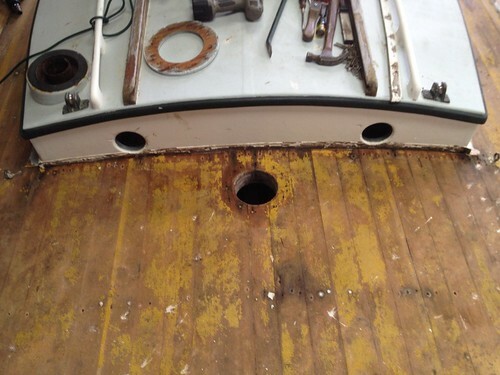 The keel still weeps in spot, with one persistent leak around an old keel bolt. It’ll take a while for the timbers to return to normal. For now it’s about ten pleasant hand pump strokes per day. 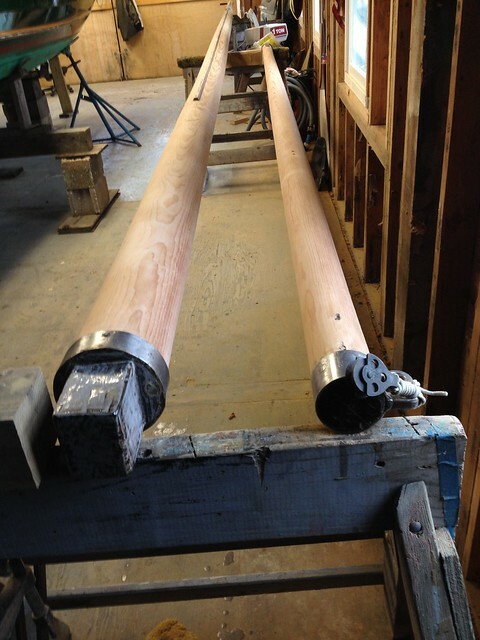 There’s been real progress on the spars. 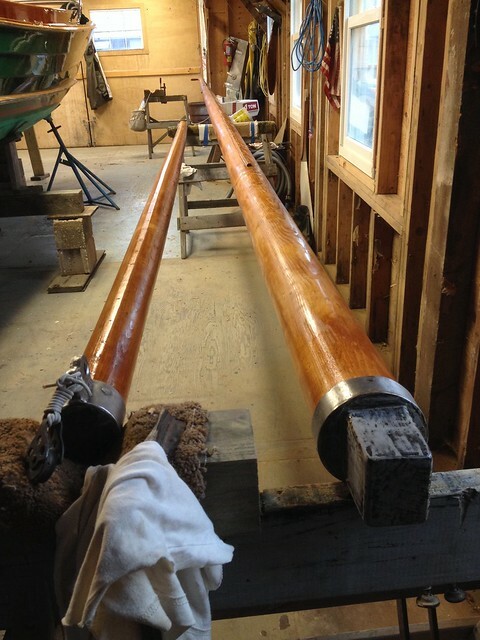 While your writer was comfortably ensconced in the hills of Tuscany in early October, Beaton’s again stepped into the breach and stripped and faired the spars. When we got back I finished the sanding and as of today, there are two sealer coats applied. First coat of varnish this weekend. The cockpit sole is moving along at my usual pace. 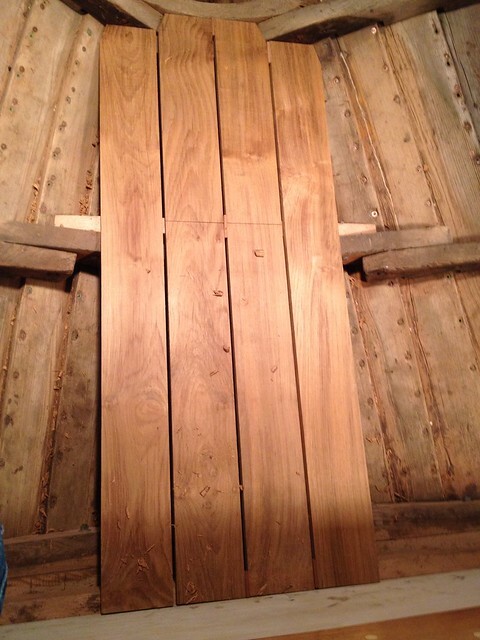 The oak sole beams have been fitted and the initial sole pieces have been milled by Paul. With any luck the stove may be in by Thanksgiving. Speaking of which, we gave our own thanks last week for recovering from Sandy two years ago on October 29, 2012. Thankfully no hurricanes this year (so far) but old Mister Northeaster may have a few lessons to give us this Winter. All sanded and ready for the first coat of Interlux sealer. No serious defects found after many years of varnish. The wood is close grained clear fir. Tough stuff. After the first coat. It will get darker after another coat of sealer and a half dozen coats of Epifanes varnish. 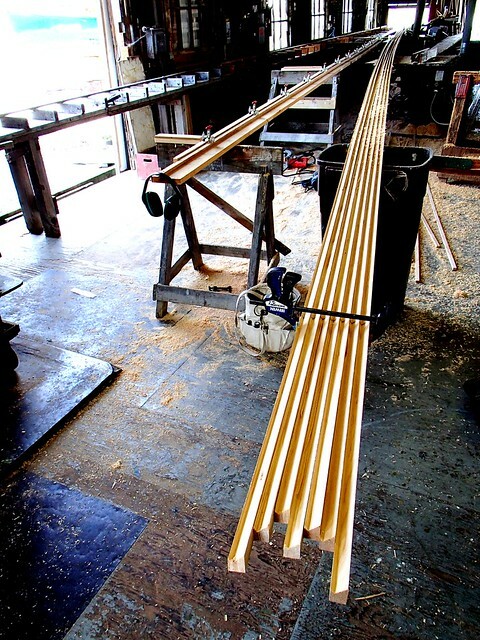 And endless sanding…. Slowly rehydrating. Nice to be able to deal with her weeping by hand pump. There’s a sump pump on board if needed. All of the old rivet holes have been plugged and sanded. The ceiling will cover most of them. Getting greener all the time. The rub rail and letters ageing nicely. Our bit of Tuscan paradise. 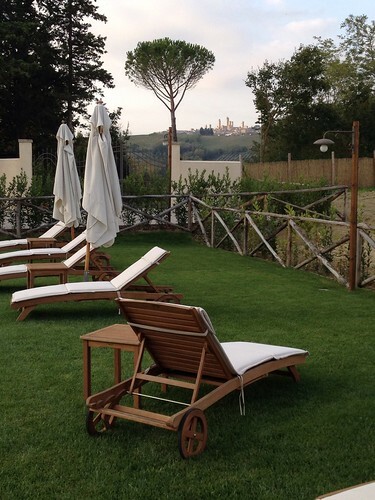 We stayed here with seven others, exploring Florence and San Gimignano which was a mile or so away. Terrific views of vineyards and distant hills. 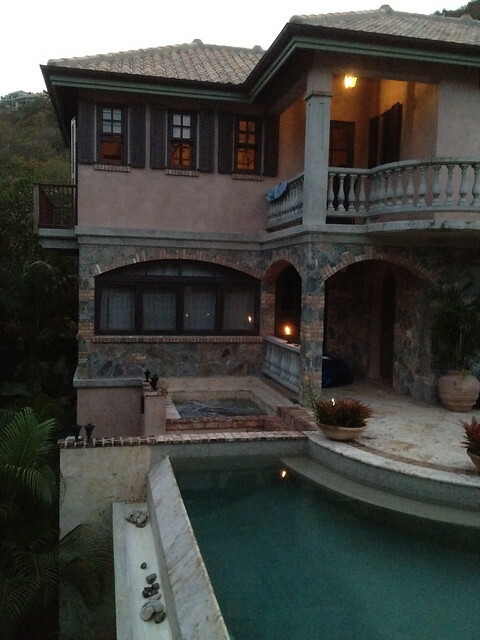 Bliss for a week. That’s San Gimignano on the next hill. Classic Etruscan hill town with lot’s of places for a glass of Vernaccia or dinner. 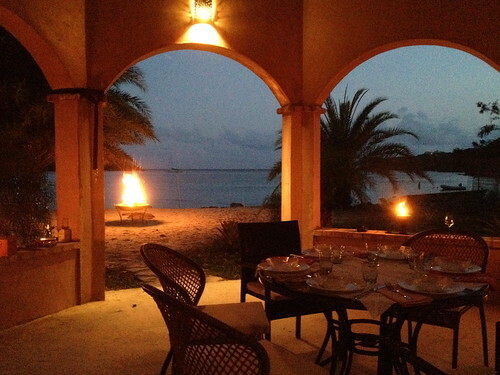 We had fine dinner at a restaurant on the edge of the town walls with sweeping views of the countryside and full moon. 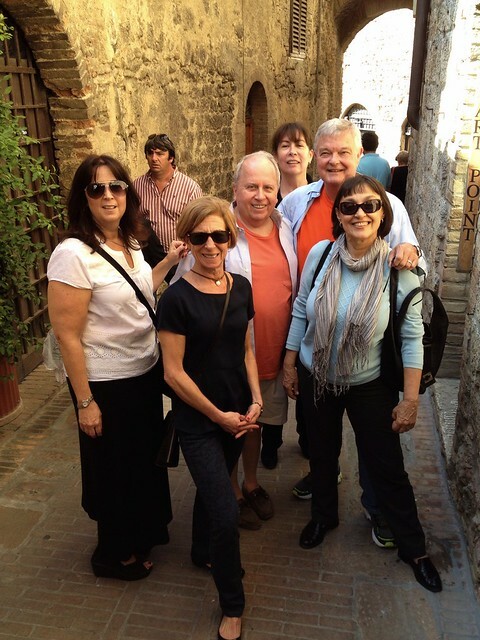 Here’s five of us wandering the streets of San Gimignano. The others were waylaid by shops and such. 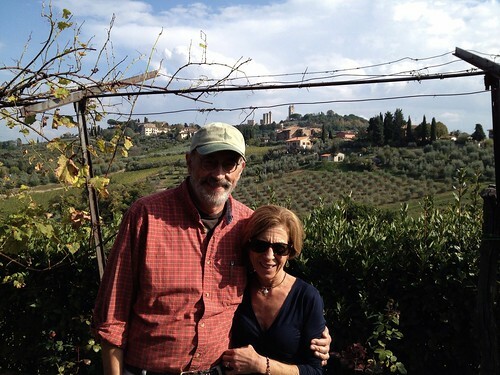 Touring a local vineyard for a tasting and later consumption of their Vernaccia. Yes, that’s San G in the background. We spent two days in Paris at each end of the trip. (You have to change planes somewhere.) 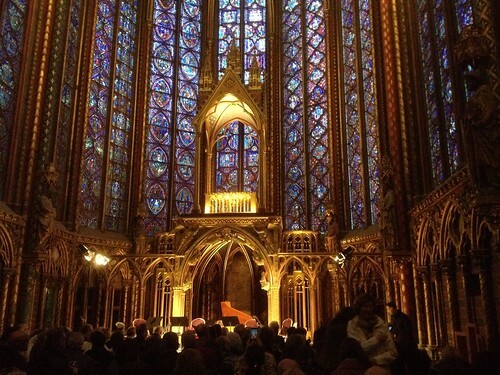 This was at a string concert of the Four Seasons at Saint Chapelle on the Isle de Cite. Finally, a bit of Beaton’s activity. 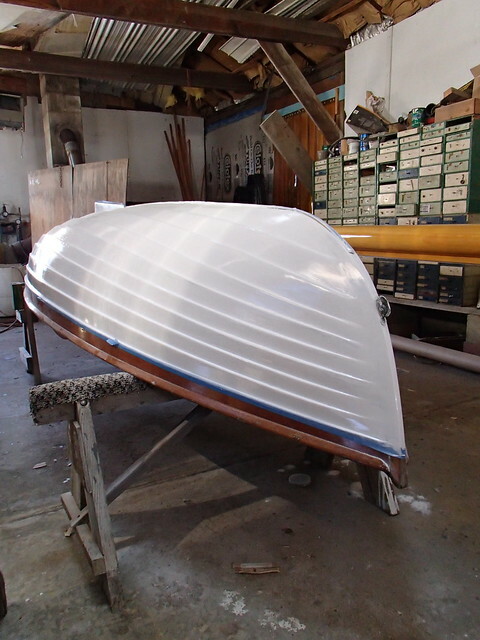 Paul Smith giving an old fiberglass dinghy a new life. The two new Duckboats are getting freshened up before storage. and making steady progress on Sjogin. 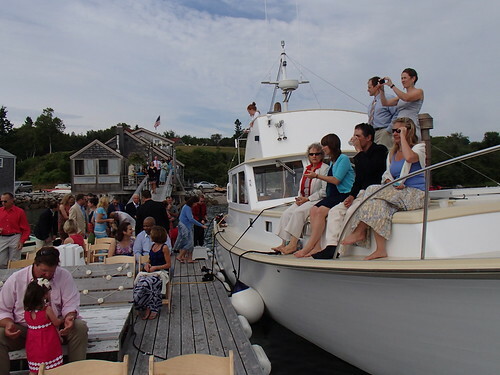 First a few pics are from our visit which also featured the celebration of forty years of WoodenBoat magazine. Hard to believe all that time has gone by. I started following the traditional wooden boat revival with John Gardner’s monthly column in the National Fisherman. That lead to the Sea Bright skiff Puffin, which lead to the tabloid cruiser Caprice, then to the Bullseye Caroline and then finally to Sjogin in 1985. 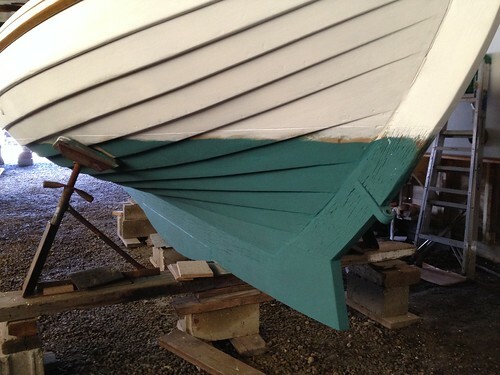 There’s been real progress on Sjogin, with the second coat of primer to the new wood applied last week. After sanding and another coat of primer, then two coats of finish complete the above deck work. Once the rails, house and coaming are finished, then the deck gets two coats of finish paint. And then on to the hull. And on and on. Lots of Duckboat building activity at Beaton’s. The first one’s off the jig and work is started on the second one. 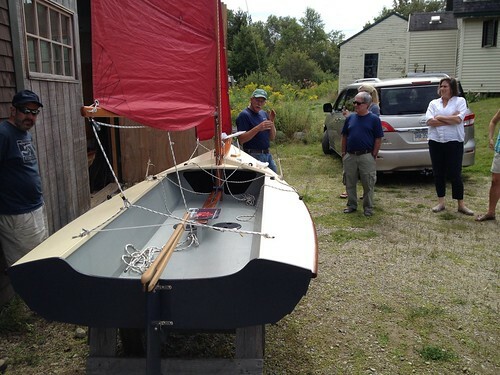 One of my favorites at Beaton’s, the catboat Irene Tasay, has been rescued and launched. Don’t forget to check the Flickr feed and FaceBook for other Sjogin pics and news. Julia and the Silent Maid. Barnegat Bay was well represented at the show with Myth and Vim also in attendance. Not at the show but at a coffee shop on the way. Looks like she works for a living. Vim in all her glory. Looking forward to seeing her under sail on the Bay. She sports a rather large rig. 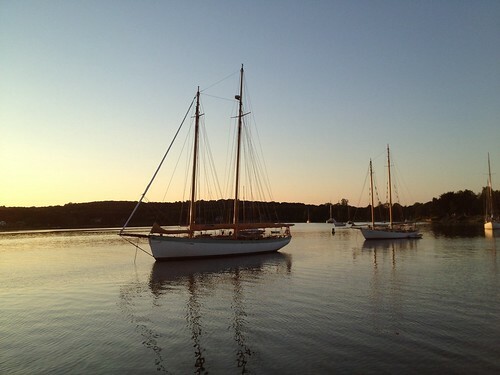 Schooners at Sunset. 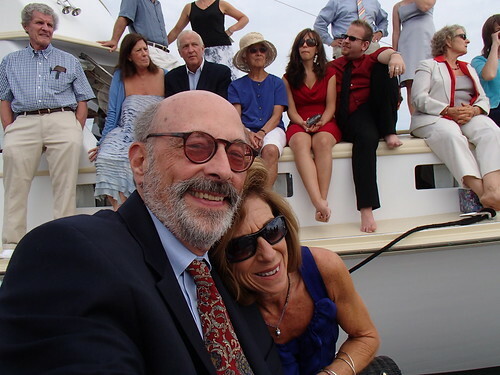 Taken during the 40th Anniversary Party for WoodenBoat Magazine. Fine event with lots of stories. 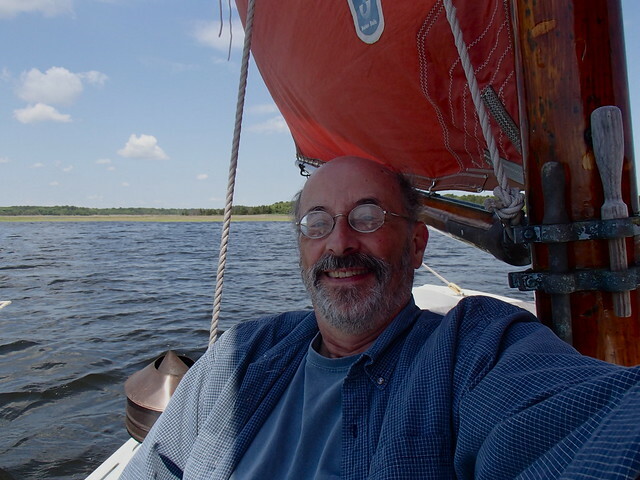 I found out at the party that Jon Wison, founder of WoodenBoat Magazine is a regular reader of this Blog. Delighted to learn this. Who knew. And thanks to all readers of Hove to off Swan Point. Still posting as slow as I can. 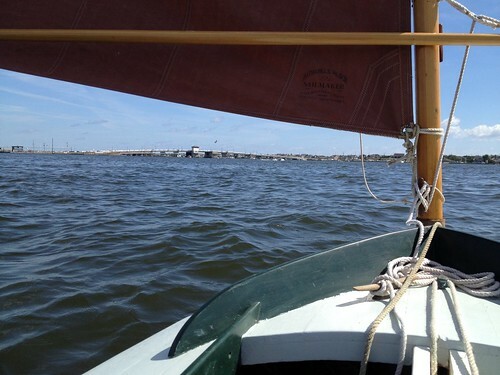 Brand new Arey’s Pond Catboat out for her maiden sail. Very happy owners on board. 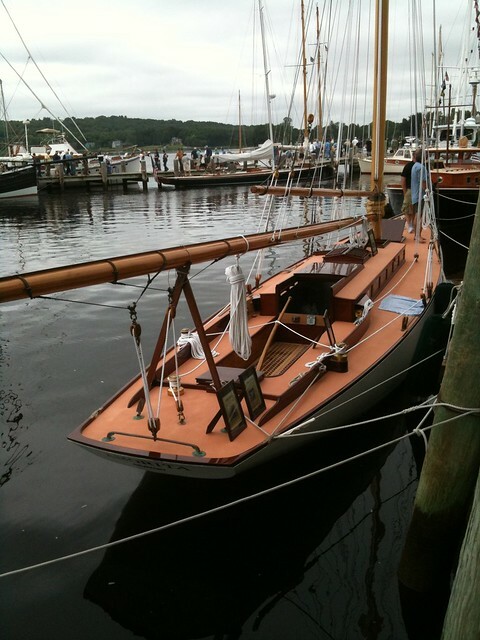 Another fine WoodenBoat Show at Mystic. Hope to bring Sjogin next year. It would be a treat to heave to next to the Morgan. Cockpit sole progress. One inch scant teak boards. 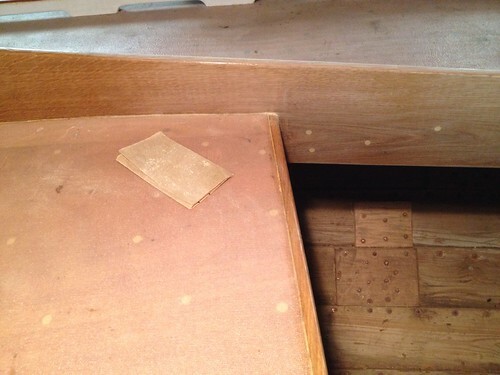 There will be more pieces added to match the planking. The new seats will cover the forward corners and be a place to store gear. 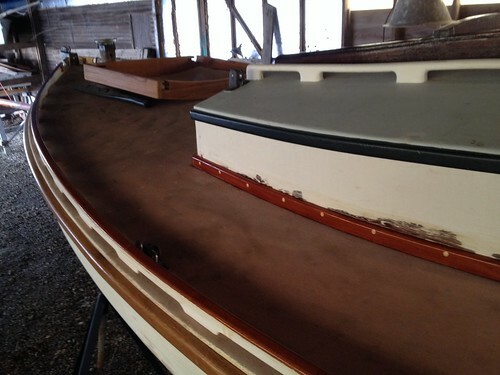 The new wood looks great with a coat of sealer but it will all be painted to match her pre-Sandy look. The new hatch sits on the deck. Sanding is next. Sanding between coats of sealer. It’s all been done by hand so far. Zen like work so far. First coat of primer on the new wood. She’s starting to look like her old self. The white really sets off the bright rub rail. Julia to start sanding and varnishing the rail soon. The painting will continue until all of the house, coamings, rub rails and such are done. Then the pleasure of painting the deck. When that’s done, the hull painting and lots of sanding will begin. I think we’ll be able to schedule a launch in late August. 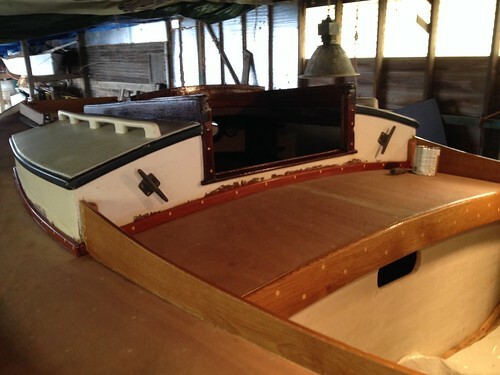 The spars still need refinishing, the cabin sole needs to be re-installed, the cockpit sole and seats need fashioning etc, etc. 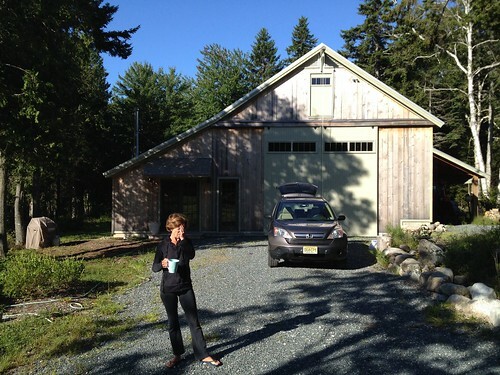 With all of that we hope to set the date for a commissioning party in mid September. 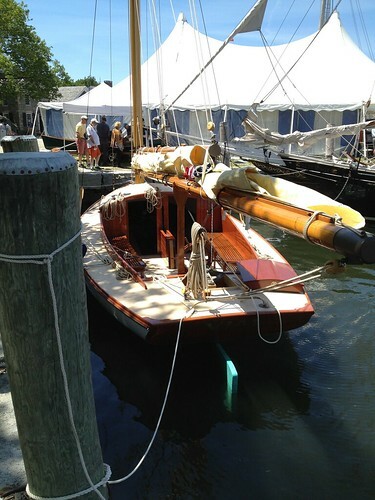 for the WoodenBoat Show. Yet another great time with new and old analog and digital friends. Here’s a link to a Flickr Set. Speaking of digital friends made analog, meet Pierre, a Sjogin fan from France. he recognized me and introduced himself. It’s always a treat when that happens. That’s Olin Stephens Bolero in the background. And there’s been a bit of progress on Sjogin. 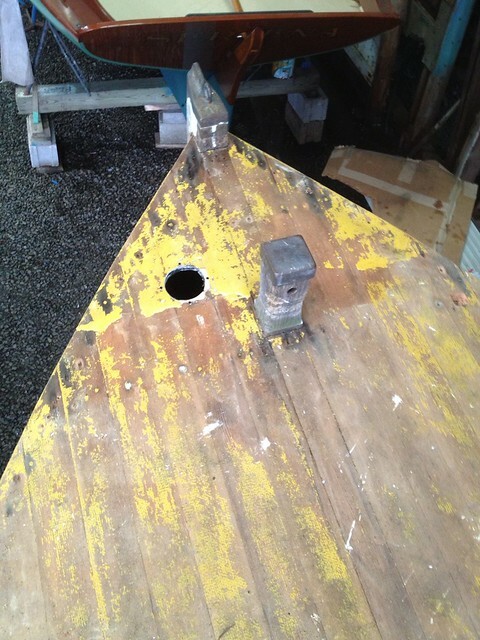 Managed to get the rest of the toe rail off along with the vent plate and molding around the mooring bit. Here’s the view from aboard Sjogin. The Port side’s not too bad but both sides are probably an inch or so lower after decades of stripping, scraping and sanding. 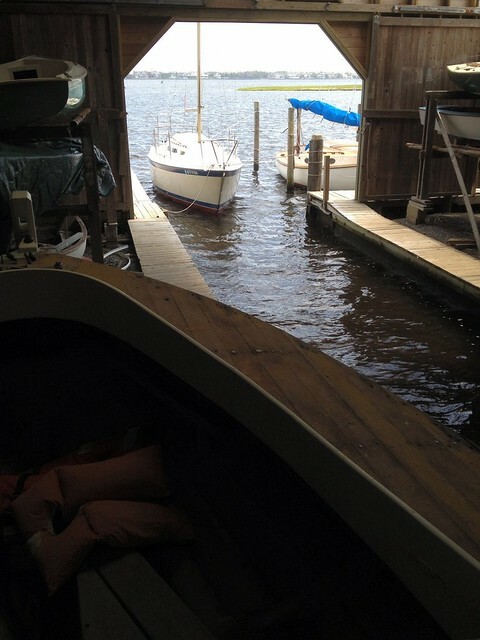 That’s my friend Joe’s boat in the pit ready for another Summer of fun. Had a consult with Paul Smith this week and Sjogin should be back in the shop in a few weeks for the next round of Beatons (and Paul Smith) magic. Went to Maine to help my brother with a bit of small boat work last week. 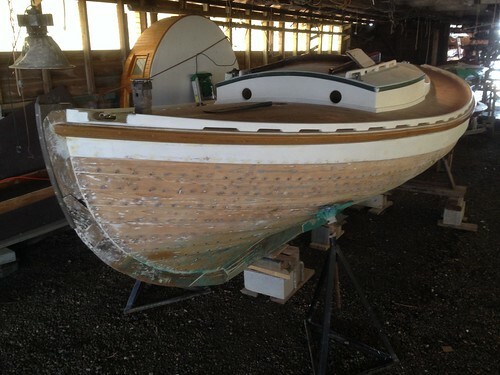 He’s started work on the 17′ Yawl boat designed by Eric Blake of Brooklin. 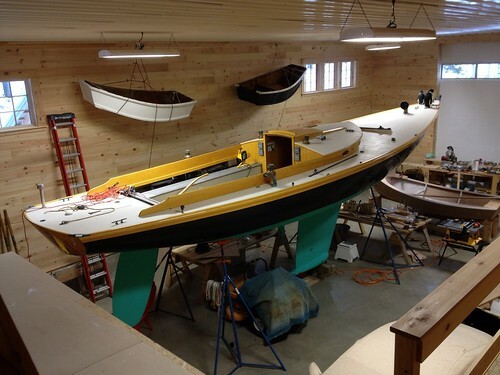 She was one of three boats built last winter by Eric, Bob and a few others. They’re burdensome little vessels, designed for comfortable exploration of the nooks and crannies of Eggemoggin Reach. 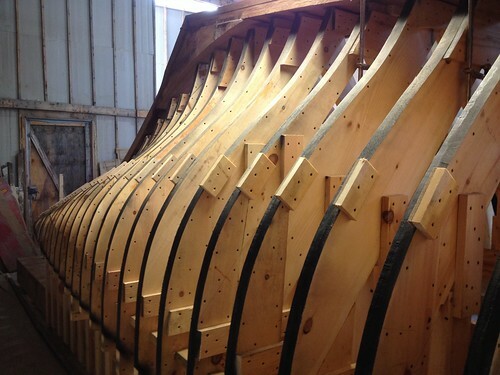 I helped get out the bed logs for the centerboard case and make a pattern for the curved coaming. Hope to see her done for our August visit. Drove up and back by myself with a stop both ways in Portland to visit with the Bauers. It’s tough to get Julia to head north this time of the year. There’s also progress on the Sjogin front. 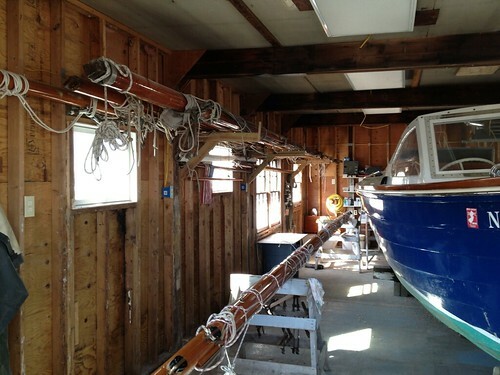 Beaton’s has pulled her mast and she’s scheduled to go in the new/old shop perhaps as soon as next week. 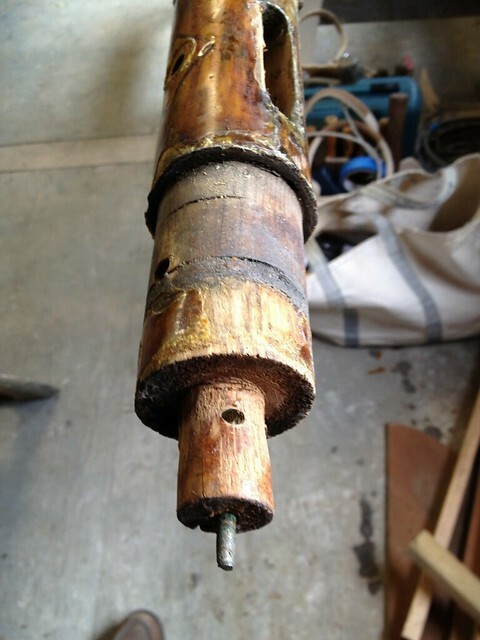 The mast’s already in there so I started taking the rigging off in preparation for stripping the varnish. 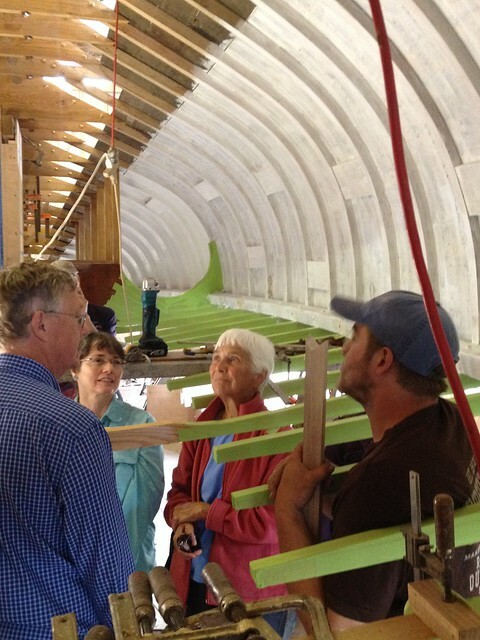 Here’s Bob fitting the aft seat slats. 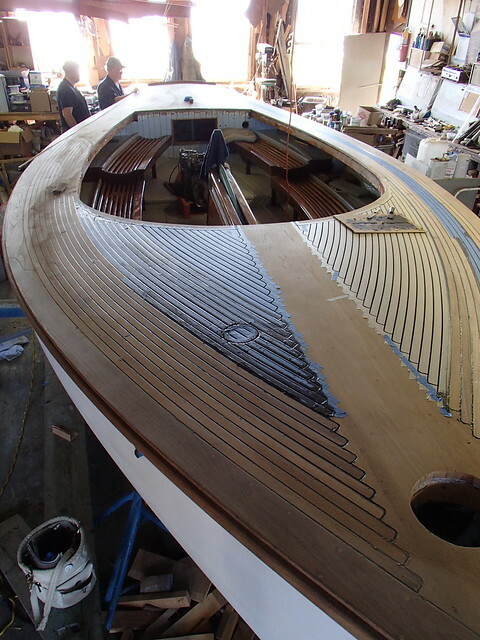 The coaming pattern’s in place and ready for final fitting. The bow of Tendress hangs over all. Here’s an overview of the new Barn. Some may recognize it as the spot where Bob and Lorinda were married last Summer. 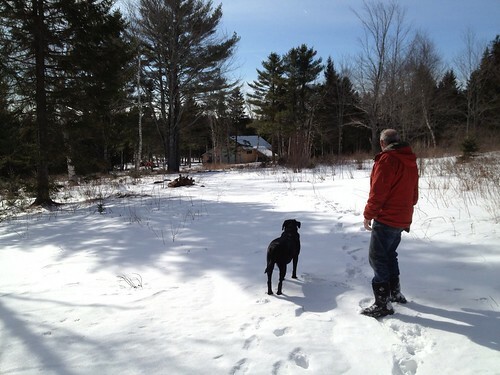 A view of the barn with Jet and Bob. Beautiful Winters day in Sargentville. I was very lucky with the weather with snowstorms bracketing my visit. A visit to Brooklin Boat Yard is essential anytime I visit. The productivity of this world class shop always astonishes me. 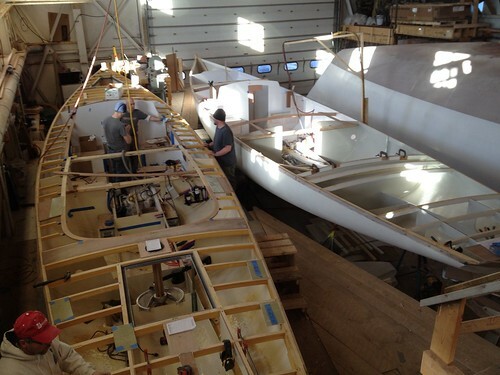 Here are two new 47′ sloops being built for June launchings. At right is a new 70′ Sonny. 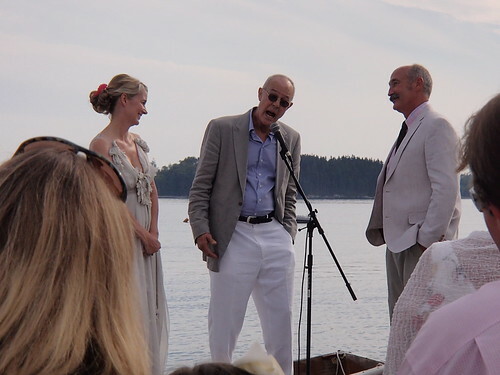 You may remember Julia and I sailing with Bob on the original Sonny a few years ago. 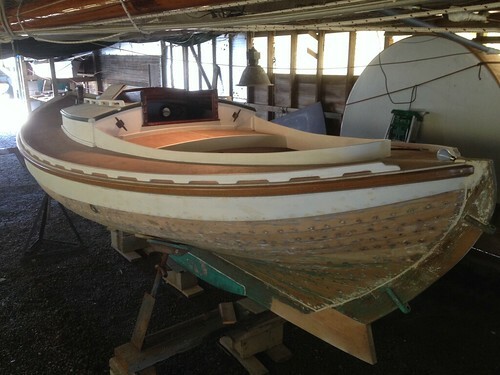 The owner, who will be 90 at the time of launch, missed his old boat and is having another one built. Beaton’s has pulled Sjogin’s mast and it’s in the new/old shop on the rack at left. I puled it down today and started removing the hardware and stays. 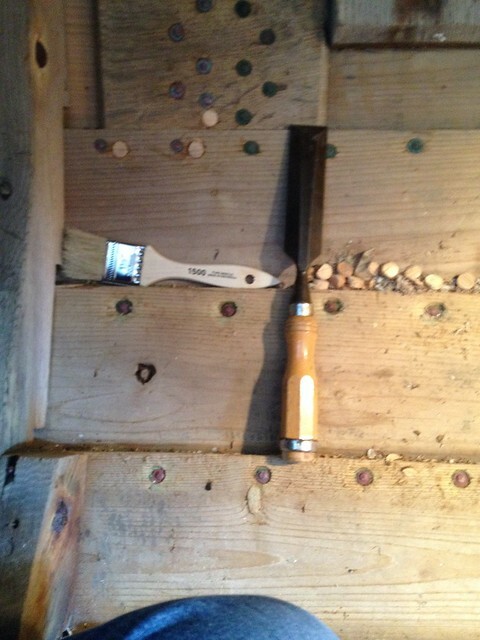 When stripped I’ll take off all the old varnish and build up new coats. This has long been one of those ‘next year’ jobs ever since I’ve had Sjogin. Amazingly enough her wind vane survived though quite mangled. At the height of Sandy, Sjogin’s mast was laying almost horizontal in the storm wrack that built up in front of the buildings. It’s a miracle that the mast survived, never mind the wind vane. It will live to fly again. After a few hours of work the cap, sheave and crane were removed. It involved a bit of grinding, knocking out drifts and some heavy hammer work. The top three stays were labeled and removed. More on Monday. Tom hopes to move Sjogin into this shop next week so I can start removing the broken bits. Progress indeed! 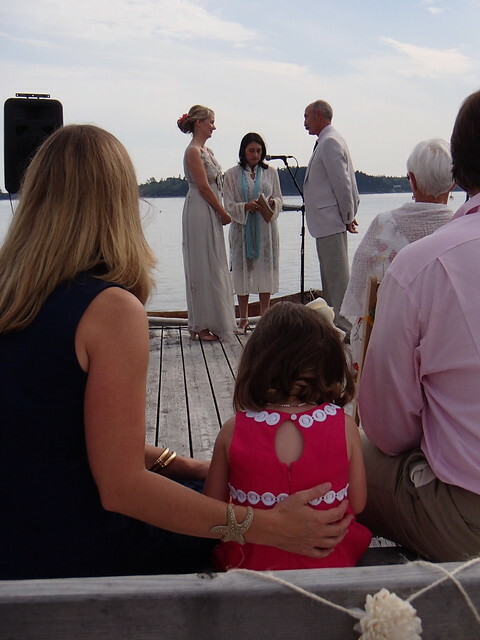 Julia and I had the pleasure last weekend of attending the wedding of my brother Bob and Lorinda. And we had the added pleasure of meeting family and friends, gathered from near and far. There was a bit of boat messing as well. 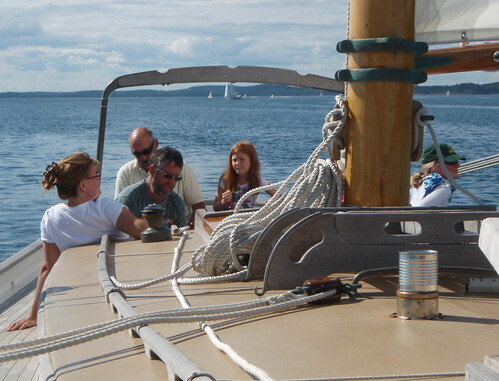 A treat was taking folks out for a spin in the Shellback. On the floats in the sun, breeze and tide. The weather held with no large wakes from passing ships. Izzy the Ring Bearer awaits. 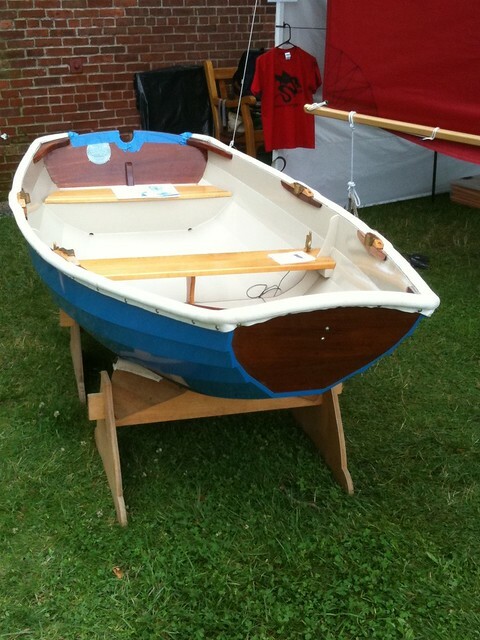 The dinghy at the end of the float is one of the Bolger Elegant Punts I built ( I did build it!) in the early 90’s. The Bride and Groom descend the ramp. There was a boat similar to Boss Lady to Port, both serving as stadium seating. Long time friend, poet and polymath Richard Jarboe recites one of his classics. Boss Lady at anchor off Buckle Island. 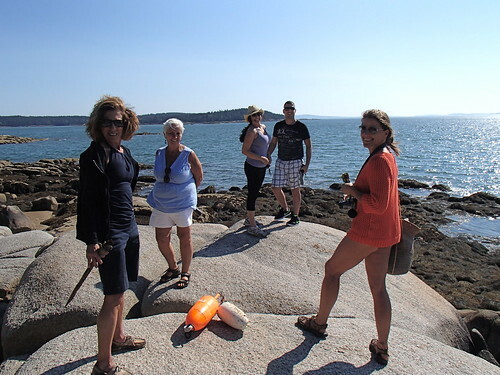 Sixteen of us cruised down to this little island in Jericho Bay on Monday after a day of recovery. Gathering treasures (and trash) on Buckle Island, a nice cruise from the Landing. 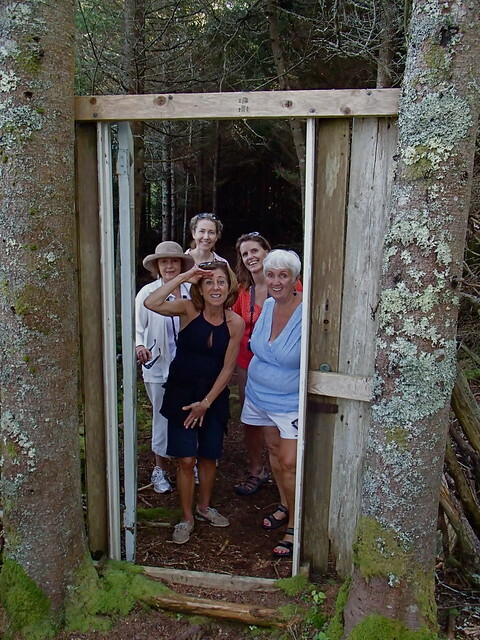 So you come upon a door in the woods….. Which is the out side? 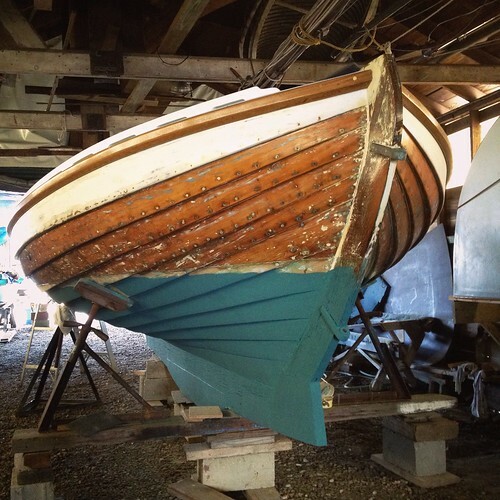 We had our usual visit to Brooklin Boat Yard in …well, Brooklin. The one without Willamsburg. We ran across Sonny, on whom we had a wonderful idyll a few years ago. Across from her is an early 20th Century 15 Square Meter completing a full restoration at BBY. It was Sea Lavender season on Buckle Island. 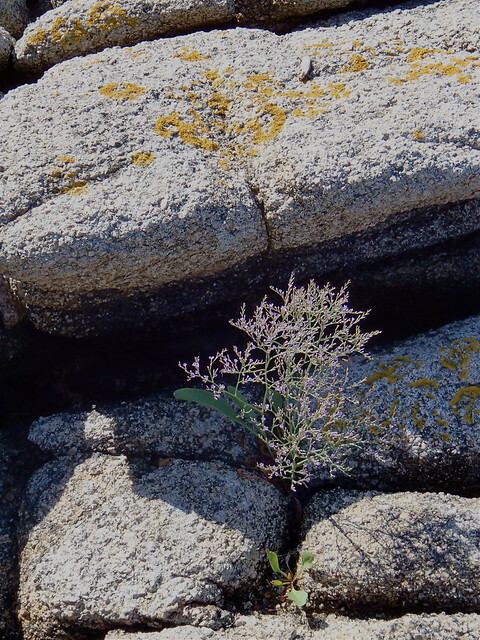 This plant was found at the very high water line, just enough sea water to keep it happy. Our Sea Lavender is a few weeks behind. A great trip but happy to be back in our almost fully renovated home. Pics to follow. It’s been a busy Summer. We’re having our home renovated which entails removing 24 years of accumulated treasures as the floors are all getting refinished. Many long delayed projects are being done, including widows on the second floor for views of the gardens, lake and distant dunes. 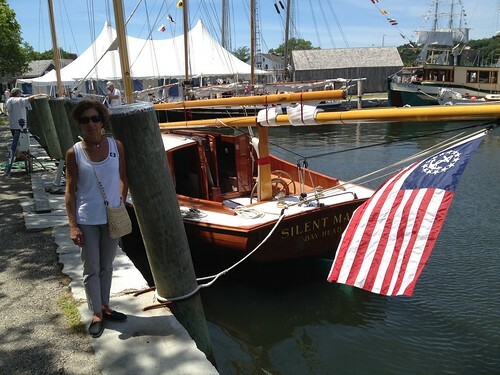 We’ve been up to Mystic for the WoodenBoat Show again, meeting new folks and renewing acquaintances both analog and digital. All this with the business, gardens and marshaling forces (thanks Andy) for the move out, it’s left little time for things Sjogin. I go down to the yard to check on her on a regular business and have taken a few pics you may enjoy. 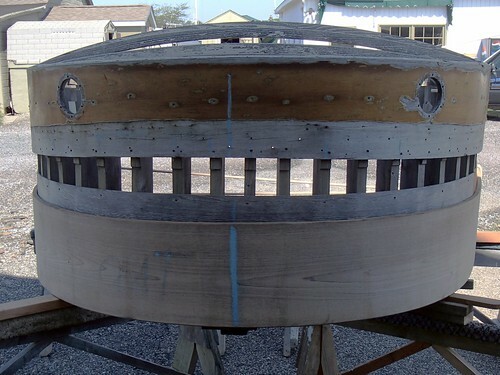 Smile, the steam bent coaming for Myth went around the old Lotus house without a problem. Myth’s deck is almost done. I have some of her just completed that shows Paul Smith’s fine work at Beaton’s. I’ll put them up next post. Here’s an old friend. 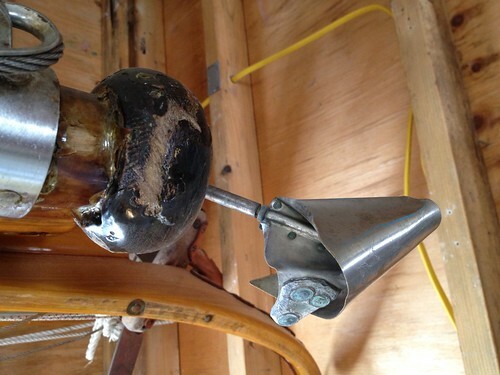 Tom Beaton and I built this Herreshoff Columbia model Dinghy in the early 80’s. Now maybe the next generation will go for a row or three. New bird’s mouth mast for Ghost (I think.) Just not going fast enough? Bettle Cat mast vs. low hanging tree limb. Here’s the loser. Indeed a Happy Skipper. This was taken in late-June; a morning stolen from the move preparation. The garden continues to shine despite my benign neglect. The new Attic window surveys all. Summer sunrise from the Attic window. 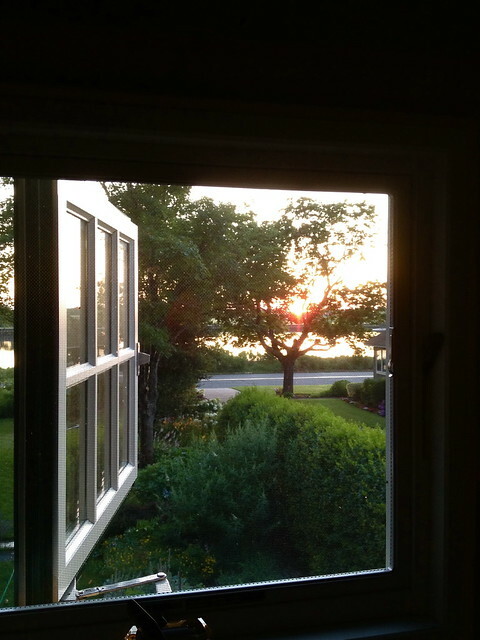 When the room is wainscoted and painted white, the sunrise will make the space glow. Fine spot for a first cup. 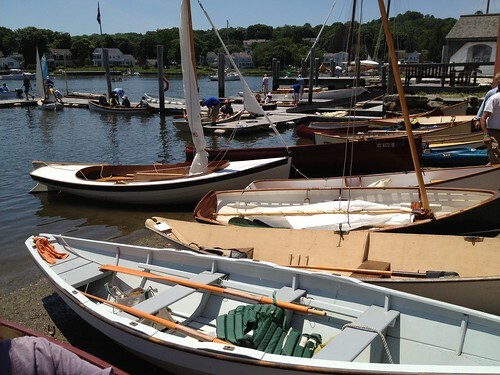 The John Gardner Small Craft Weekend coincided with the WoodenBoat Show. Double the fun! One of my all time favorites. 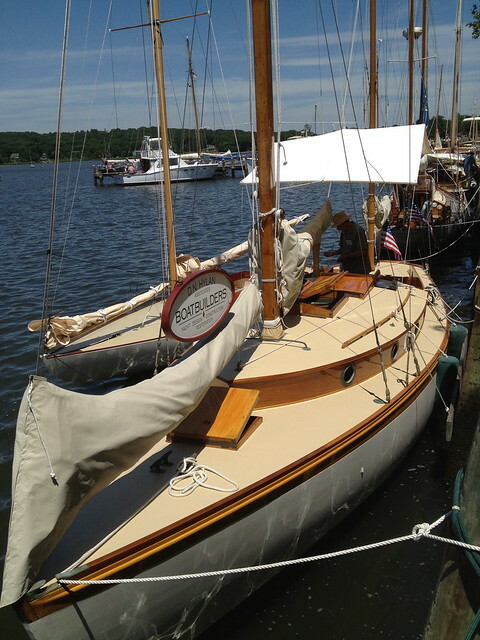 This is Aida, one of N. G. Herreshoff’s finest shallow draft yawls. 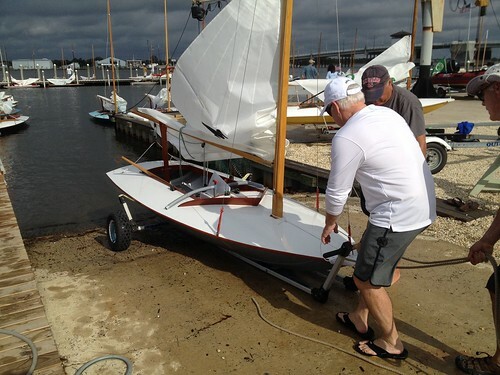 She would be perfect for Barnegat Bay as she only draws 3 feet. 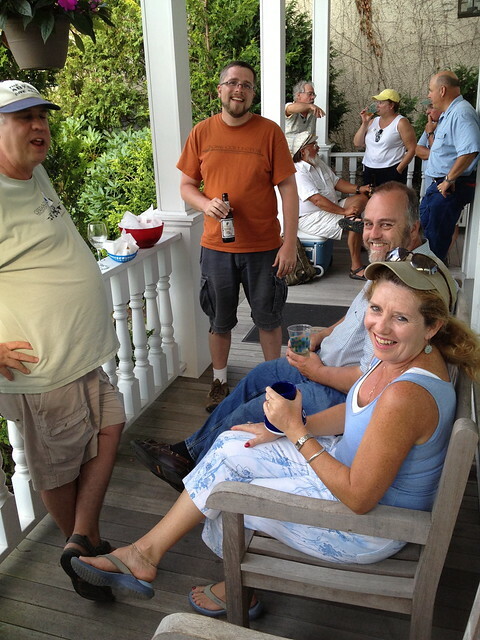 After last years gap, we continued our tradition of hosting a quick Saturday afternoon party on the Whaler Porch for our WoodenBoat Forum friends. Margo’s smile fills the foreground. 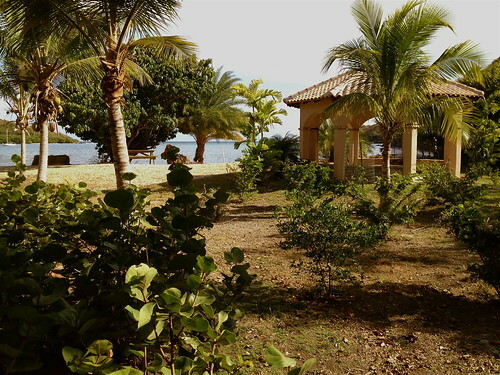 As promised, here are a few pics from our recent visit to Butterfly Beach on St John. It’s the Fish Bay home of our friends Dave and Cheryl. We spent a very relaxing week and a half unwinding with a daily 5:00PM soak in the hot tub and visits to the local beaches. Paradise indeed. The Gazebo on the beach on Fish Bay. 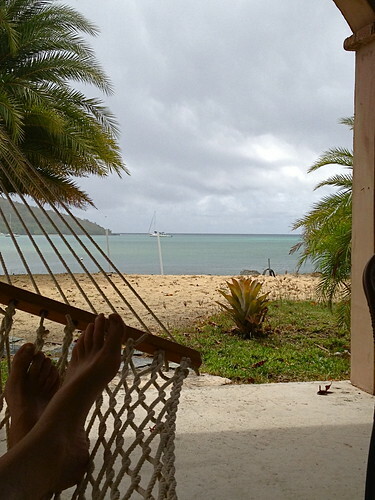 There’s a hammock inside with an over the toes view of the Caribbean. 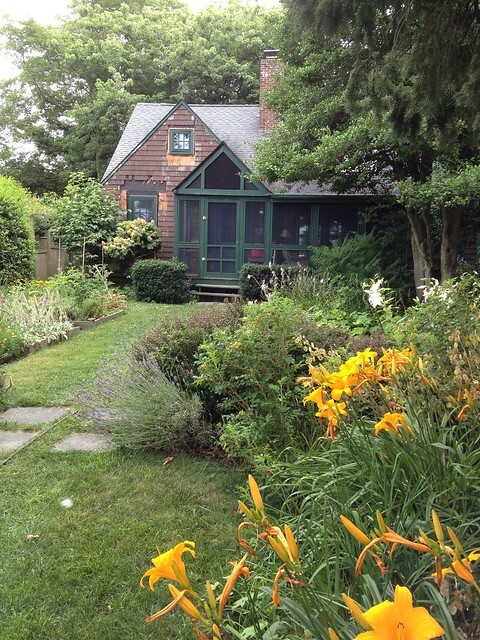 The Pool Cottage. There’s a mangrove framed view of Fish Bay from the balcony. On the Second Day Tour. Trunk Bay frames Julia, Joe, Annie and Cheryl. Dave is out of view video taping. Just before dinner on our last night at Butterfly Beach. Another fine tradition that started with a sunset gun. 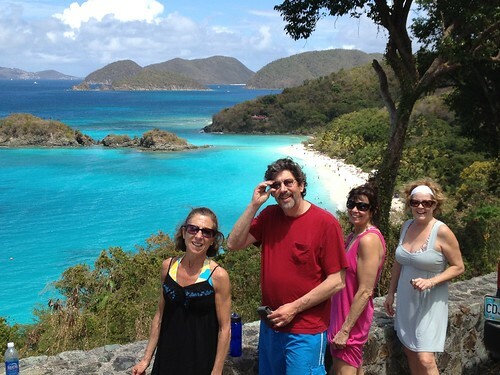 Thanks again Dave and Cheryl for another perfect vacation together. and still no rudder. When we were away I had hopes of hearing of a sighting but no such luck. I had planned (there’s that word again) to wait till December to haul Sjogin and spend the Winter replacing her rub rails, wooding the hull and such. 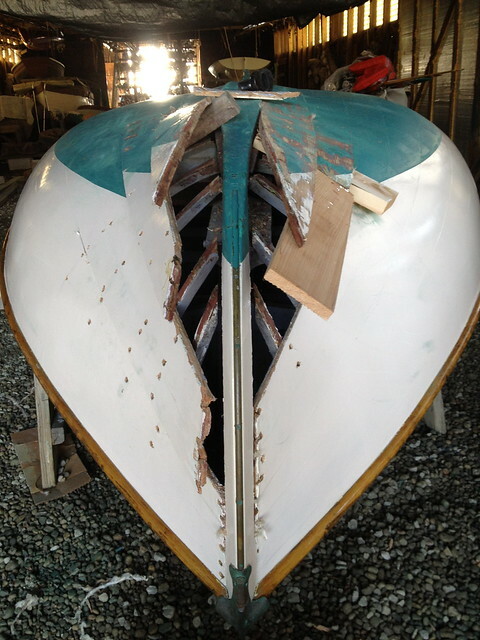 Oh well, she’s getting pulled next week so the repairs and new rudder construction will just start that much sooner. 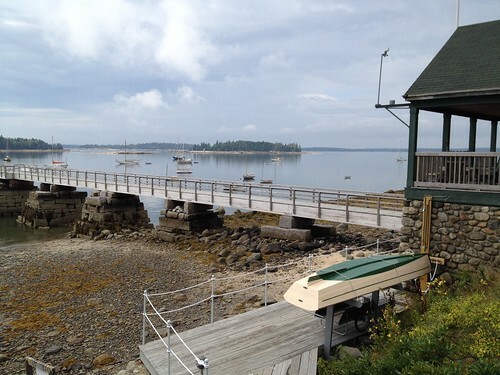 Maine was wonderful as always. Only one day of showers which suited for our Blue Hill shopping expedition. We had two sails on Tendress and a great beat up the Reach on the 89 year old Malabar II. 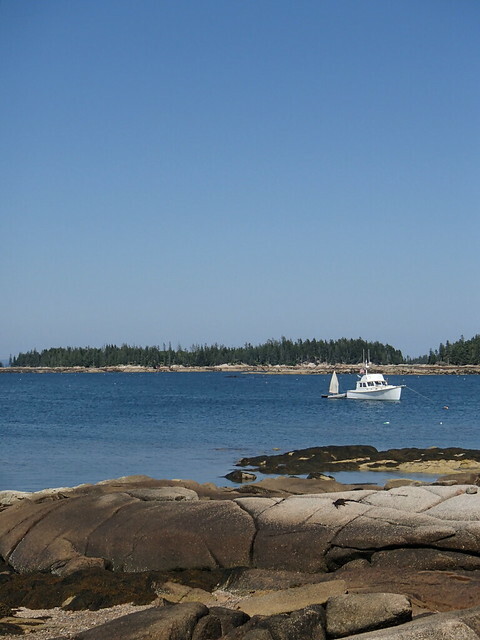 Sandwiched in between was a picnic cruise to Pond Island on Boss Lady with dramatic views of Acadia. Paradise indeed. We also visited with John Brooks at his shop in Brooklin. Looking forward to seeing the Silver Penny plans one of these days. Soaking it in. 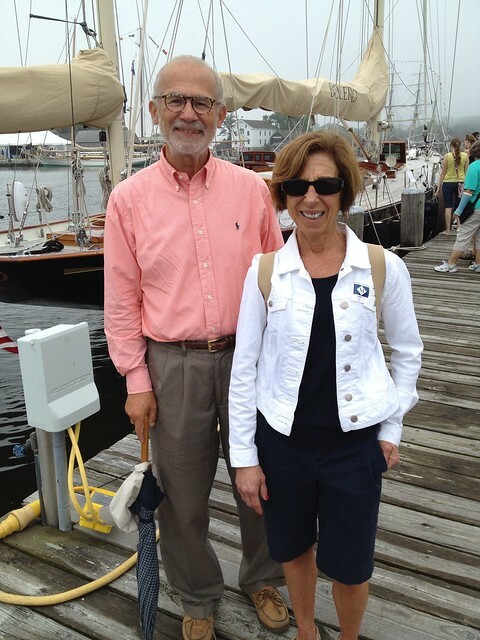 At Brooklin Boatyard in Center Harbor where Tendress was built. 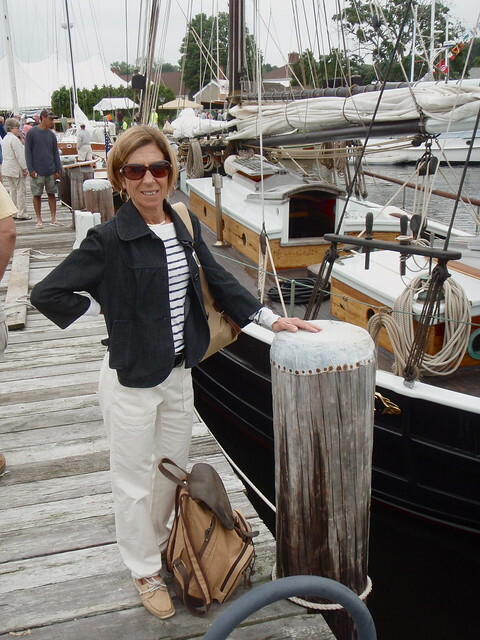 The black schooner over Julia’s shoulder is Malabar II. 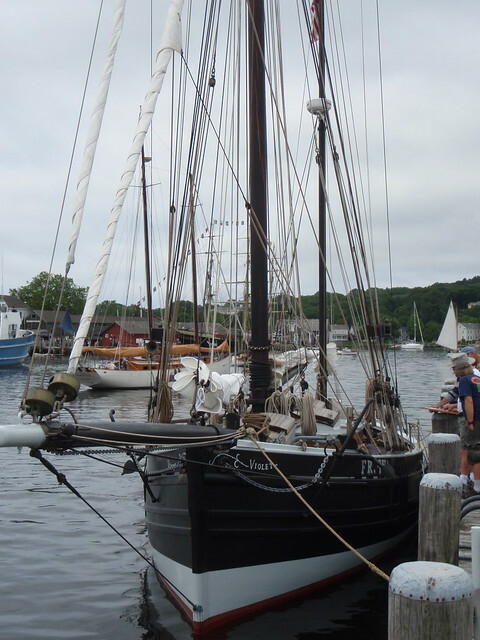 She was built in 1922 and under the stewardship of her current owner for the past 37 years. 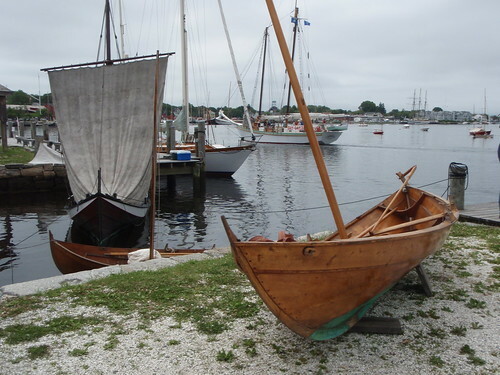 Her design was done by John Alden of Boston, the second in his eventual ten boat series based on New England fishing schooners. Enjoying another beautiful sunset at the Landing. Seven year old Fiona driving Malabar II down Eggomoggin Reach. More later and when I cull the iPhone pics. 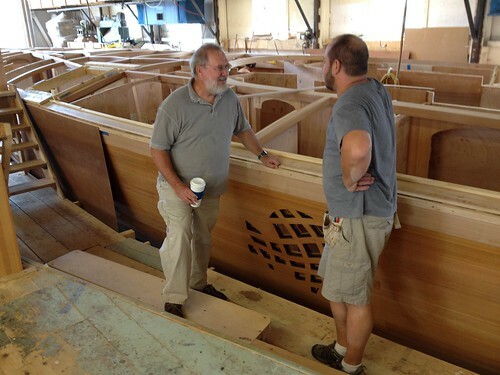 Also a Post this week on the Duckboat Worlds preparations. 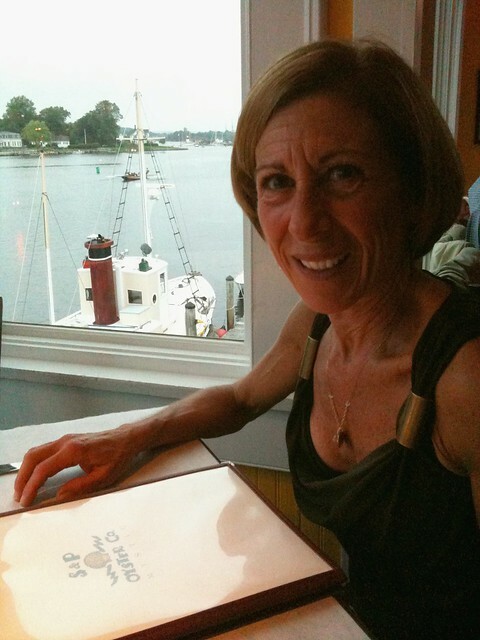 Julia and I were in Mystic the weekend before last for the annual drinking of the Kool-Aid. This was the twentieth anniversary of the show and had all the usual ingredients. It was I think our fifth year at Mystic. We missed the regular get together with out Forum friends at Doug and Carters. Perhaps next year. 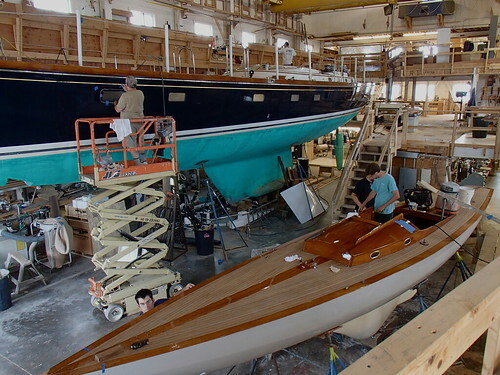 WoodenBoat and Mystic are very happy with each other and I expect the show will be here for a while. It was a treat meeting John and Ruth Brooks and talking about his Silver Penny design based on Sjogin. This was our favorite boat by far. 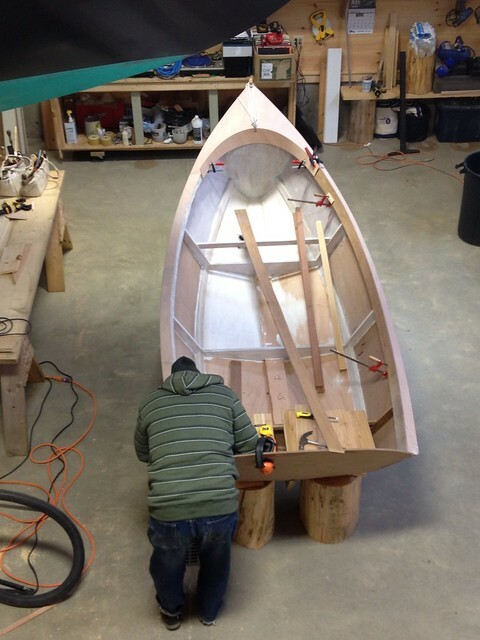 Harry Bryan designs and builds boats, mostly off the grid, in New Brunswick, Canada. 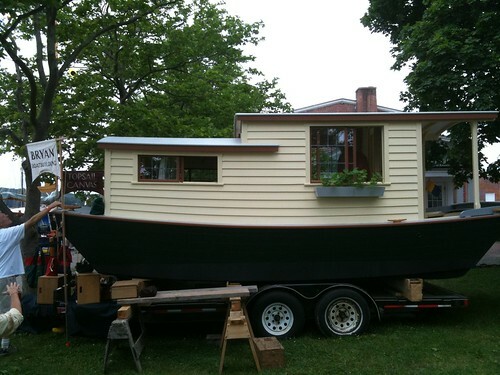 Very simple with a wood stove and comfortable seats and berths from which to watch the world drift by. 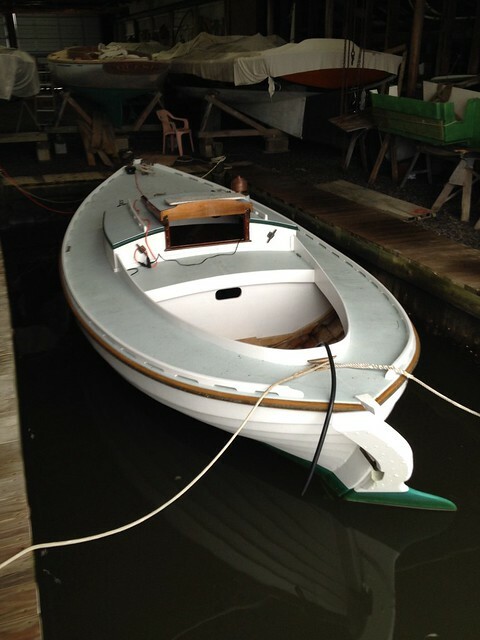 A small powered skiff or punt would serve as a tow boat as there’s no engine installed. I have vision’s of her sitting on a mooring at Beaton’s. Hmmm….. 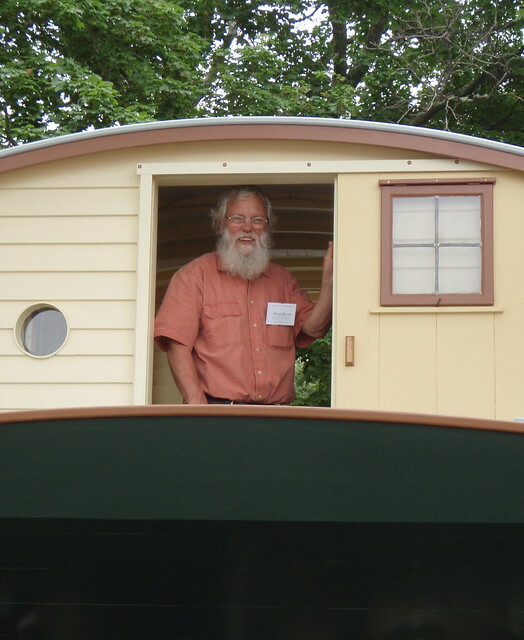 When I asked Harry to pose for a pic he said “you want mustard and relish on that?” His Shantyboat would make a great floating hot dog stand. Julia and Violet, an authentic Zulu, a type of Scottish sailing trawler. The John Gardner Small Craft Weekend coincided with the WoodenBoat Show so there were more traditional small boats than usual. 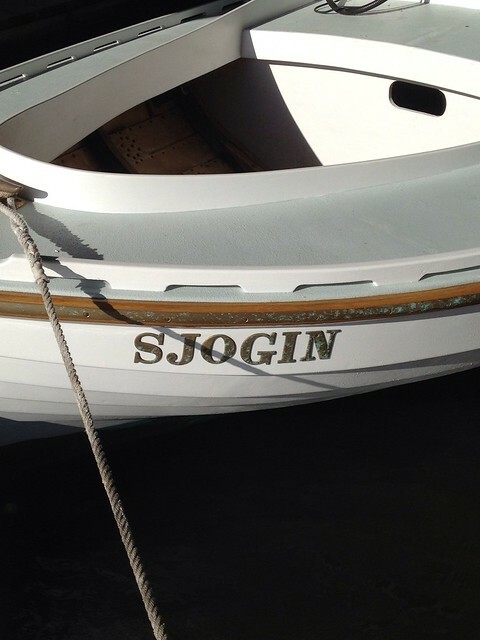 These boats are all Sjogin’s cousins. Nicely modeled pram from John Brooks. She would look good towing behind Sjogin. 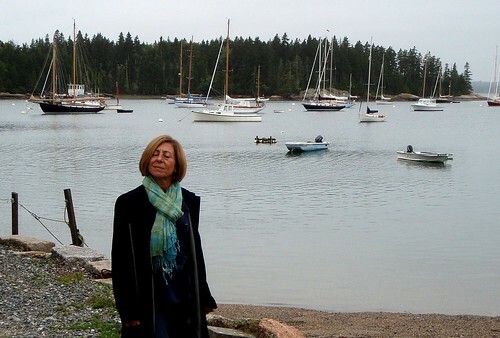 Amorita, the NY30 that was run down and sunk by Sumurun, a 94′ Fife ketch two years ago. 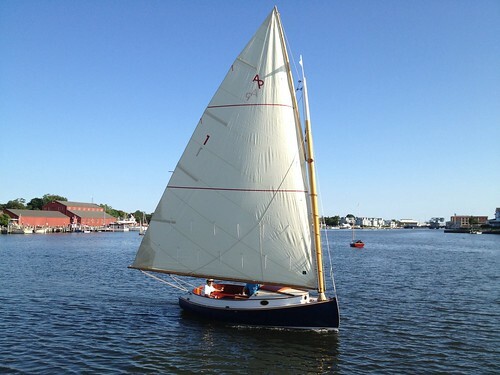 She’s been fully restored by McClave, Philbrick & Giblin in Mystic. 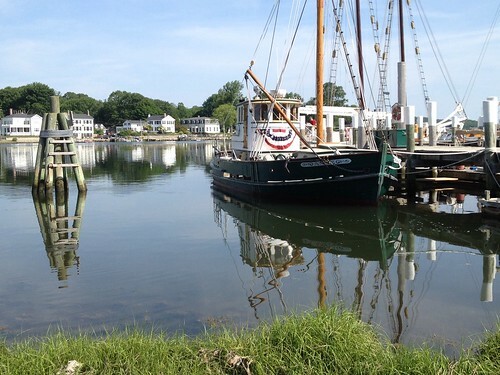 A charmed boat for sure and a great story. Thursday night’s dinner at the S&P Oyster Company. Lobster tacos please! The Seaport is just up the river.